The Galaxy Tab comes with either 16GB or 32GB of internal storage. It’s like the hard drive in your computer. That storage is used for your apps, music, videos, pictures, and a host of other information. You probably didn’t get a Galaxy Tab because you enjoy managing files on a computer and wanted another gizmo to hone your skills. Even so, you can practice the same type of file manipulation on the Tab as you would on a computer. Is there a need to do so? Of course not! But if you want to get dirty with files, you can. The main tool for managing files is the Quickoffice app. You may have seen that app used to display a Microsoft Office document download or file attachment. It can also be used to view PDF files. But when you choose the Quickoffice app from the Apps Menu, it opens as a sort of file manager. Quickoffice can also be used to create new documents: Touch the New button. Further, it can synchronize with Google Docs, Dropbox, or a number of online file-sharing websites to help coordinate files you may store on the Internet. Another popular file-management app is ASTRO. Just search for ASTRO in the Market. 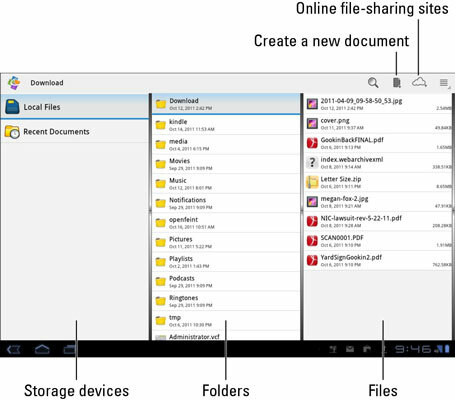 Some file-management apps may appear on various menus as you use the Tab. For example, if you choose an image, you may see a prompt asking you to select either the Gallery or the File Management app to view that image. If you simply want to peruse files you’ve downloaded from the Internet, open the Downloads app, found on the Apps Menu screen.